Fall protection demonstration at May 12 stand-down event held outside Nationals Park in Washington, D.C.
From May 8 to12, employers, workers and safety professionals from across the country joined OSHA and partners in the National Safety Stand-Down to prevent falls. 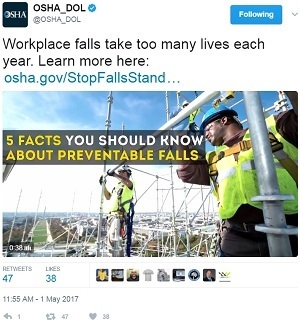 The weeklong event encouraged construction industry employers to emphasize the importance of preventing dangerous on-the-job falls – not just for one week, but throughout the year. This is the fourth year OSHA has hosted the national stand-down. Turner Construction Co. stopped work on more than 1,000 projects around the world to engage trade contractors on safety. Developer Skanska USA held a "Ballpark Grand Slam for Safety" at the fairgrounds at Nationals Park in Washington, DC. that featured demonstrations on fall prevention, displays of fall protection equipment, and awards for top-performing supervisors. Werner Ladder sent 30 safety demonstration trucks to jobsites across the country, reaching 25,000 workers. Thousands of other employers have shared photos of their stand-down events on Twitter using #StandDown4Safety. We are retweeting some of our favorites and encourage the continued submission of photos using this hashtag. For more information on the stand-down and preventing falls in construction, visit the National Safety Stand-Down webpage. Holder Construction Group LLC has entered a Strategic Partnership with OSHA to protect workers from hazards during construction of a data center in Elk Grove Village, Ill. Elements of the partnership include providing job site safety orientation to the project's nearly 300 workers, and ensuring that all contractors and subcontractors have site-specific safety and health programs. For more information, read the news release. The OSHA and the Mid Continent Exploration and Production Safety Network renewed a three-year alliance in April to promote worker awareness of industry-related hazards and solutions in the exploration and production of oil and gas. As part of the alliance, last spring OSHA staff delivered a presentation focused on confined space safety to more than 80 workers. Kentucky Occupational Safety and Health conducted 15 on-site consultation visits in April to help employers comply with workplace safety and health standards and to reduce injury and illness rates. Employers corrected 87 serious hazards that could have affected up to 3,197 workers and resulted in enforcement penalties of up to $609,000. This demonstrates the benefits of the confidential services offered by OSHA's On-site Consultation Program, which are free to owners of small and medium-sized businesses. For more information, read the news release. Central Machining & Pump Repair Inc. contacted OSHA’s On-site Consultation Program to conduct a safety and health walkthrough of its machining, welding, and fabrication facility in Minot, N.D. After consultants identified several hazards requiring abatements, CMP hired a full-time safety manager, and invited OSHA consultants to re-visit its facility several times. CMP made significant safety and health improvements that reduced its injuries and insurance costs. After attaining an injury rate well below the industry average, CMP was accepted into OSHA's Safety and Health Achievement Recognition Program. For more information, read CMP's success story. A worker at a Toledo, Ohio, automotive parts supplier lost his hand and part of his arm in a shredding machine. OSHA's investigation of Autoneum North America found that the company failed to equip the machine with safety guards and train workers on lockout/tagout procedures, and exposed workers to struck-by hazards from machine parts. The company was cited for three willful and two repeated violations and proposed fines of $569,463. For more information, read the news release. Michigan Occupational Safety and Health Administration issued a Cease Operations Order to Sunset Tree Service & Landscaping LLC in Bay City for exposing workers to potentially serious injuries by continuing to operate without abating previously identified hazards. MIOSHA inspectors determined that the company failed to adequately provide safe access to feed rolls on a wood chipper, failed to guard a shaft on the wood chipper, defeated the safety features on an operator safety control bar, and failed to train workers in safe tree trimming operations and practices. From 2011 to 2017, the company has had an extensive history of safety and failure to abate violations. For more information, read the news release. Kentucky Occupational Safety and Health cited Metalsa Structural Products Inc. in Hopkinsville for exposing workers to safety hazards. 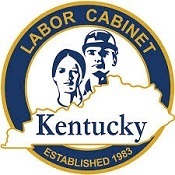 Kentucky OSH inspectors concluded that the company failed to ensure proper that lockout/tagout procedures were followed while workers performed maintenance on a robotic machine, exposing them to amputation hazards. Inspectors also found that the company failed to conduct inspections on the control of hazardous energy and attach lockout/tagout devices on machinery. The company was previously cited for violations of these standards in 2013. An administrative law judge with the Occupational Safety and Health Review Commission upheld OSHA's contention that A.C. Castle Construction Co. Inc. and Daryl Provencher, were operating as a single employer at a Wenham, Mass., worksite when three employees were injured in a 20-foot fall from a scaffold. The employees were working on a residential roof when the wooden plank on the scaffold snapped. Both companies contested the citations and penalties, with A.C. Castle claiming it was employed by Provencher and, therefore, not responsible for the safety of the workers. The judge upheld most of the citations and ordered A.C. Castle to pay penalties totaling $173,500. Read the news release for more information. Pan Am Railways Inc. has been ordered to pay an employee $260,000 in punitive and compensatory damages after a federal appeals court found that the railroad retaliated against the employee for filing a Federal Railroad Safety Act whistleblower complaint. The railroad claimed the employee, who works in a rail yard in Waterville, Maine, was being dishonest when he tried to report an injury. The case was appealed as far as the U.S. Court of Appeals for the First Circuit, which denied the railroad’s petition. OSHA enforces the whistleblower provisions of 22 statutes that protect employees who report violations of various laws. For more information, read the news release. With summer fast approaching, the North Carolina Dept. of Labor is offering a series of free 90-minute webinars on the hazards of heat stress in construction and general industry. Topics to be discussed include key definitions, causal factors, heat disorders, health effects, prevention, control, engineering controls, personal protective equipment, administrative controls, acclimatization, re-acclimating, work monitoring and training. At the end of the course, students should have a basic understanding of methods to prevent or minimize exposure to excessive heat in order to prevent heat stress. In addition, students will be able to recognize symptoms of heat stress along with tips on how to treat heat stress victims. The first webinar will be held on May 22, and six additional webinars are set for May and June. For more information or to register, see the webpage. In April, the National Safety Council conducted a free webinar, "Driving Distraction-Free and Defensively" as part of its annual campaign for Distracted Driving Awareness Month. 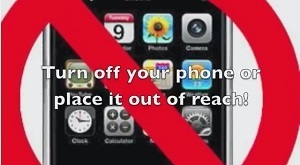 Motor vehicle crashes are the leading cause of worker fatalities year after year, and distractions such as using a cell phone while driving dramatically increases the risk of such crashes. NSC's webinar offers recommendations not only on eliminating distractions in your own vehicle, but also on how to be alert and react to the actions of other distracted drivers on the road with you. The webinar is available online as a video and a PDF that you can download.